Posted in Announcements, eThreads rePurpose, Press | Also tagged announcements, eThreads rePurpose | Comments Off on eThreads in People StyleWatch Magazine! We are proud to announce that eThreads.com was mentioned in Accessories Magazine! I have been reading this magazine for years, it’s an important industry source for all things accessories. I interviewed with them a few weeks ago, it was a lot of fun. Thank you Jeff and Accessories Mag for the opportunity! 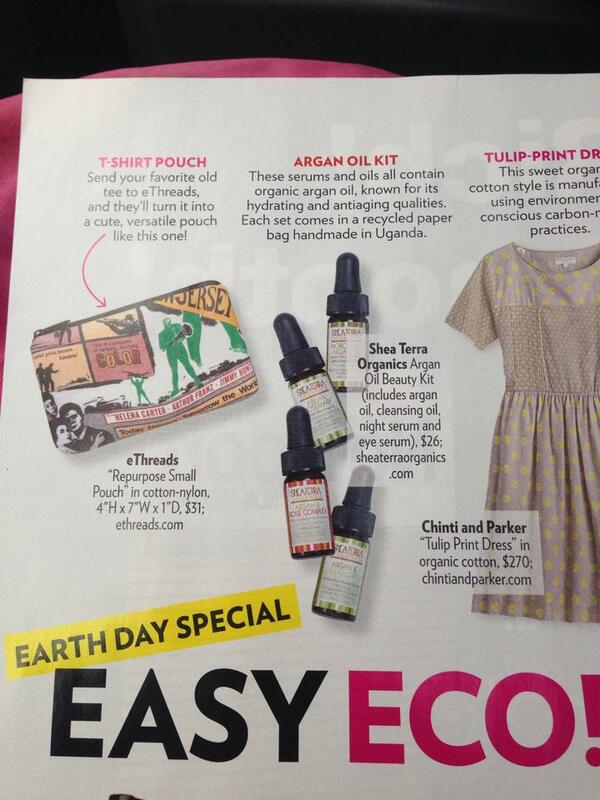 We are thrilled to be included in ShopSmart Magazine. 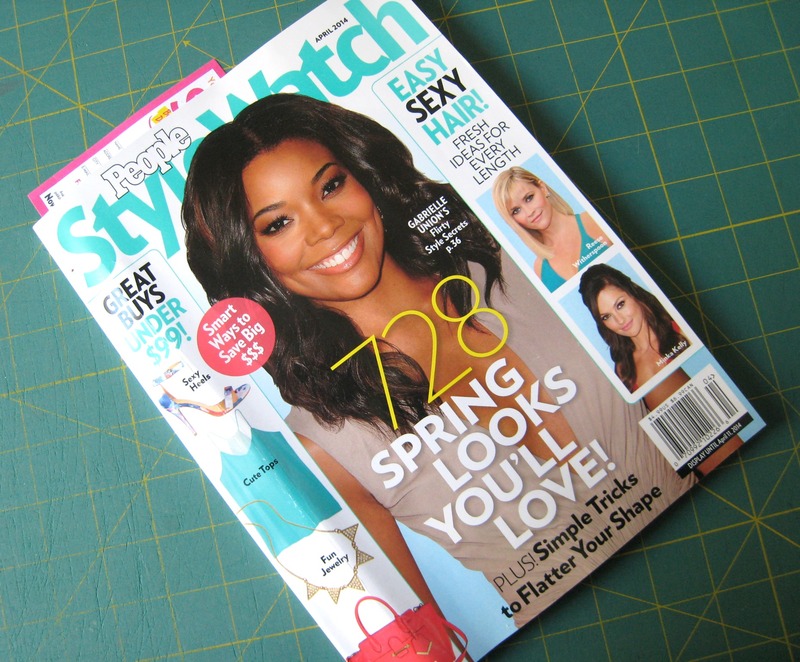 The publication is Consumer Reports’ Quick and Easy Shopping Guide and highlights great, reliable buys. 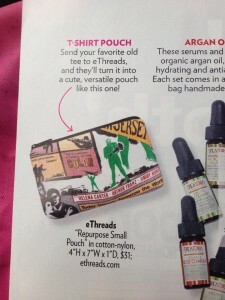 The magazine secretly ordered a bag from Elemental Threads, reviewed their experience, then told us we were going to be in the magazine! I remember the bag they designed because I had not seen the combination before. 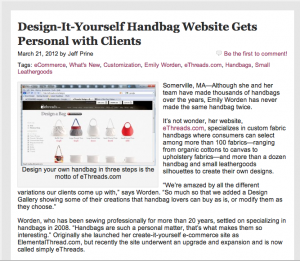 Thank you ShopSmart for the writeup! I met the lovely Althea Blackford at a show in downtown Boston last year. She is very involved in the fashion Boston scene and also produces a fashion show called Style It Up. She generously asked eThreads to stop by and talk about our custom-made bags, and we were happy to oblige! The episode aired on local Boston networks, and you can watch the full segment here. Thank you to Althea and the entire Style It Up crew … it was awesome to watch you guys work! Pink is the New Bag! As if that wasn’t fun enough, Trent went one step further and wrote about our adventure on PITNB! It is so exciting to be a part of his fantastic site, and Trent could not be any cooler. Click here to read the full post and see some fun reader comments. Then stick around and read more of Pink is the New Blog, I am sure you will love it! Posted in Announcements, Press, Testimonials | Also tagged Ruffle Tote, Testimonials | Comments Off on Pink is the New Bag! Elemental Threads bags make great bridal party gifts! We love making custom-made bridesmaid bags — they are so unique and it’s a joy knowing eThreads is part of such a special day. Elisabeth designed large pouches for her bridesmaids and one as a (well-deserved) gift to herself! Each design was as beautiful as the last! 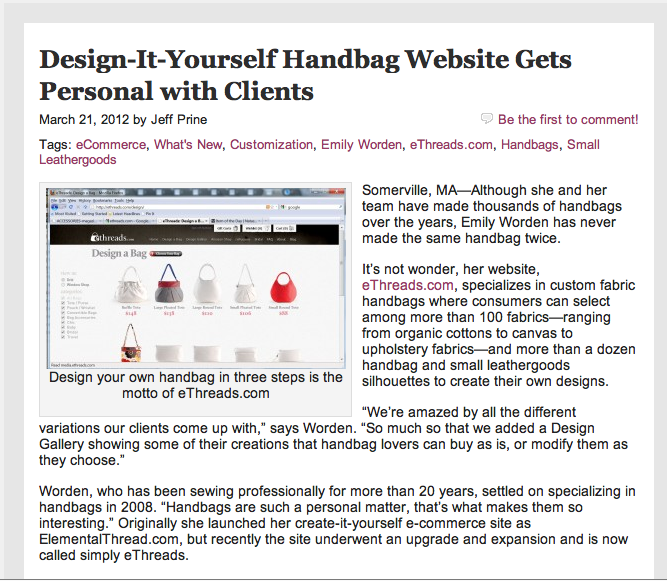 She also had fun news to add- she was featured the fun fashion blog, StyleNymph.com, rocking her eThreads bag! Thank you Elisabeth for sharing the great Style Nymph post and congratulations on your wedding! We were approached by the fabulous ladies at Real Moms Real Views to participate in a review and giveaway. RMRV is a review/giveaway site that focuses on great products for moms and their kids. We were happy to partner with them and today the review is up! RMRV is also giving you a chance to win your own Straight Wristlet! Click here to read the full article and get the info! We were approached by Macaroni Kid Hunterdon to participate in a review and giveaway. Macaroni Kid is a national newsletter and website identifying all the great things parents and kids can do together. Our New Jersey friends thought eThreads would be great for their readers and we are happy to announce the review is up right now! Not only that, we are giving MKNJ readers a chance to win their own Straight Wristlet! Click here to read the full review and get in on the fun! Elemental Threads is excited to be participating in the 1st annual Custom Week! Running June 6th-13th, Custom Week highlights today’s top businesses for custom products from apparel to ice cream- even your mattress! Checkout the website for coupons from over 30 different companies including 25% off from eThreads. You can also enter to win a custom prize package worth $2500! eThreads is proud to be included in a list alongside so many other unique and creative companies. The custom made chocolates from Chocri are our favorite, share yours with us! Express your creative side and join us in celebrating Custom Week! We love to get shout outs from all the bloggers out there and today’s gem comes courtesy of The Fashionable Gal. Read on and find a 20% coupon for Elemental Threads! I love my new wristlet from Elemental Threads! It’s SO well made! Unlike some bags it looks like it’s going to last me for a long, long, long time! I highly recommend Elemental Threads! They have great customer service and ship super fast! Thank you Fashionable Gal! Click here to read the full review and get a coupon.